Just a few weeks ago The South African Rugby Legends (SARLA) were deeply moved by a Facebook post by a Maritzburg College Old Boy, Michael Bennett, who himself had just experienced an event which once again illustrated the inspiring ability of rug-by to transform our country. Bennett, performing medical duties at Maritzburg College, had just watched an exciting match between Maritzburg College’s Mighty 10th Rugby Team and Hilton College when he noticed some unusual activity taking place on the field between the College’s U16C Team and a local development team from Edendale, Pietermaritzburg, coached by Lion Mduduzi. 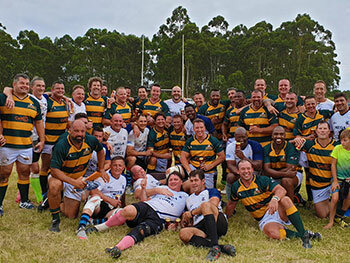 A heart-warming story, Bennett watched how, when it became obvious to Martizburg College’s Mighty 10th Rugby Team, that some of the Development Team Players enter-ing the field did not own boots, they lent them theirs without hesitation. SARLA picked up on this beautiful act of humility and display of true sportsmanship and immediately put out a call on social media for assistance and support. This resulted in support from PUMA in the form of boots and SARLA contributed jerseys in addition to the offer of free eye testing and support for all players by Execuspecs, Westville Mall. 2019 celebrates the 10th Anniversary milestone of SARLA’s Rugby Development initia-tive, VUKA. Today the programme is a well-established and joint grassroots develop-mental initiative between SARLA and SA Rugby. The VUKA programme has made great strides in the promotion of rugby in non-traditional rugby playing schools and in disadvantaged areas and is a key contributor to the transformation of rugby across South Africa. Established in 2008 in the Western Cape with just 3 participating schools, today VUKA has grown exponentially. Reaching over 478 schools in 11 of the 14 official SA Rugby Unions across South Africa, with more than 300 committed coaches, the program is embraced by Rugby Unions which include the Western Province, South Western Dis-tricts, Eastern Province, Griffons, Griquas, Lions, Bulls, Leopards, Falcons, KZN and Free State Rugby union regions. 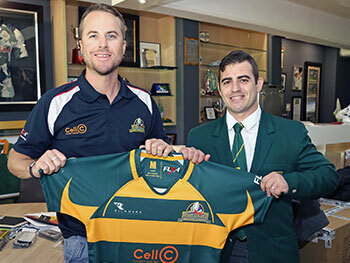 Forming part of SA Rugby’s national development objectives, VUKA receives their full support and endorsement, reaching both boys and girls between the ages of 15-19. This ensures that our youth receive the positive benefits of regular coaching sessions which provide essential life lessons, both on and off the field. 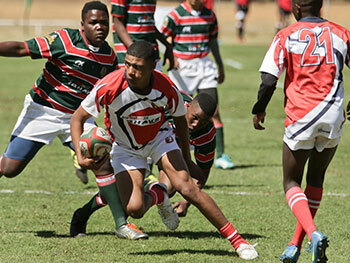 In addition, the program provides extensive scouting opportunities to ensure that players with talent are select-ed for various rugby events throughout the year. An event such as this is a proud indication of the success of the development of rugby in our country to date and a major reason for SARLA’s initial founding by Gavin Vare-jes, SARLA’s President. Through the support of our rugby Legends, SA Rugby and our many corporate sponsors, we are able to fulfill our mission, impacting the lives of so many of our youth.